Amazon.com description: Product Description: The Book That Changed The Way America Does Business In 1987 Miller Heiman published a book that turned conventional thinking on its head and offered powerful, practical lessons that broke down the boundaries of traditional product-pitch selling. 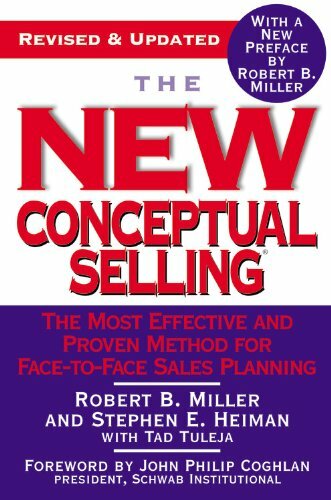 This modern edition of the classic Conceptual Selling shows why Miller Heiman has become the world's most respected name in sales development, with a client list leading the Fortune 500. And it shows why the principles of Conceptual Selling are more important today than ever before. The New Conceptual Selling Even in a world of cyber commerce, nothing beats a face-to-face meeting. And if you're one of those men and women who make their living in this highly demanding environment, this new edition of Conceptual Selling will change the way you interact with customers and clients, and the way you conduct your business career. Learn: * How to identify your customer's real needs and use listening as a powerful selling tool * How to tailor every sale you make to one specific client-and how to create a system that is consistent, flexible, and successful * How to earn and maintain your credibility-by creating a pattern of Win-Win sales * How to use Miller Heiman Personal Workshops to identify your strengths and weaknesses-and make the changes you need to make.